5) Identify the countries which border more than one ocean. a) Oceanic crust are much younger compared to Continental crust. d) The largest portion of Earth’s volume is occupied by core. a) Pressure gradient force, coriolis force, moisture content. b) Coriolis force, pressure gradient force, friction. c) Friction, moisture content, pressure gradient force. d) Moisture content, centripetal acceleration, coriolis force. 11) Consider the following statements regarding ocean currents. 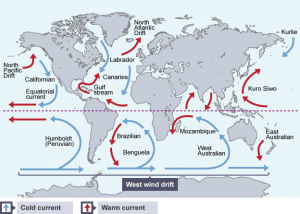 Explanation: In general the cold currents move eastern coast of continents at higher latitudes. Example Labrador current , Oyashio current. (Hence statement 1 is incorrect). a) More than 200cm of annual rainfall. c) Low annual range of temperature. d) Dense canopy with little light reaching the forest floor. d) New York and San Francisco. 14) Consider the following statements regarding HOT deserts.